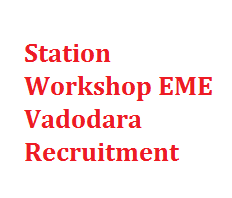 Station Workshop EME Vadodara has circulated a recruitment for below mentioned various mechanics Posts 2015. Here are the details of Qualification and salary drawn. For salary discussion you can call to toll free number. - Certificate from a recognized ITI in the motor mechanic trade or Armed Forces Personnel or Ex-servicemen from the appropriate trade and minimum at grade 1. - ITI certificate from a recognized Industrial Training Institute in the Machinist or Turner or Mill Wright or Precision Grinder; or Armed Forces Personnel or Exservicemen from the appropriate trade and minimum at grade 1.